There are currently 84 people online. KFA2, the European focused NVIDIA only graphics card partner, announced today its launch of the new series of graphics cards; the MDT series – (Multi Display Technology) The KFA2 GTX 560 Ti MDT X5 and the KFA2 210 MDT X4 is aimed at the multi-display user. This new series of graphics cards are powered by the ViewXpand VMM1400/1402 chipset enabling the end-user to stack, clone and even create a virtual single display across multiple screens without having the extra expense of having to upgrade other system components. The KFA2 GeForce GTX 560 TI MDT X5 is the only GTX 560 Ti graphics card in the world that supports a maximum of 5 monitors simultaneously. Enjoy multiple screen gaming utilizing the virtual single screen mode, providing a virtual resolution of up to 5760x900 (1440x900 on each display) in 4-monitor mode or 5040x1050 (1680x1050 on each display) in 3-monitor mode. 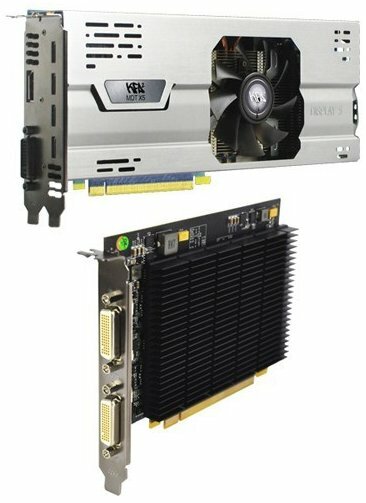 This single graphic card can run 5 displays providing the perfect solution for any multi-display users. The KFA2 GeForce 210 MDT X4 is the only GeForce graphics card in the market that supports quad 1080p displays, ideal for heavy multi-tasking business and home users. Powered by the IDT VMM1402 chipset, this single card supports x4 1080p monitors on each GPU display output, providing the perfect solution to enable efficient multi-screen workstations, video walls or heavy multi-tasking. “Multi Display Technology not only allows you to increase the size of desktop space, but with multi-tasking being key, these cards provide the ultimate solution in multi-display computing at a cost like no other solution on the market.” said Graham Brown, European Marketing Manager. Both cards are bundled with WinSplit Revolution desktop management software and are backed by a 2 year warranty and will be available at leading online and in-store retailers throughout Europe.